QUESTION: How do I repair a leaking faucet on my bathroom sink? My bathroom faucet constantly drips water. The faucet is turned off but still leaks. The faucet has 2 handles and leaks 1 drop every 5 seconds. What is the easiest way to fix my leaking bathroom faucet? ANSWER: A part in the faucet is worn out and needs to be replaced. 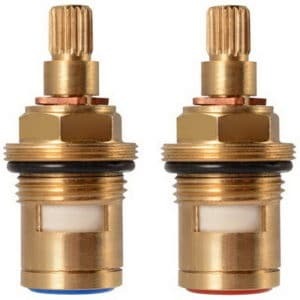 Depending on the type of your double handle faucet, the faucet contains either a CARTRIDGE, COMPRESSION/REVERSE COMPRESSION, or CERAMIC DISC type. These components wear out with time and will need to be replaced or repaired when found to be leaking. Which side is leaking on my faucet? To find out which side is causing the leak, turn off one of the water supply valves under the sink. If the water stops leaking, then you found the correct side that is leaking. If the water still leaks from the faucet, then you know the other side is leaking. Remember to turn off both water supply valves when repairing your leaking faucet. 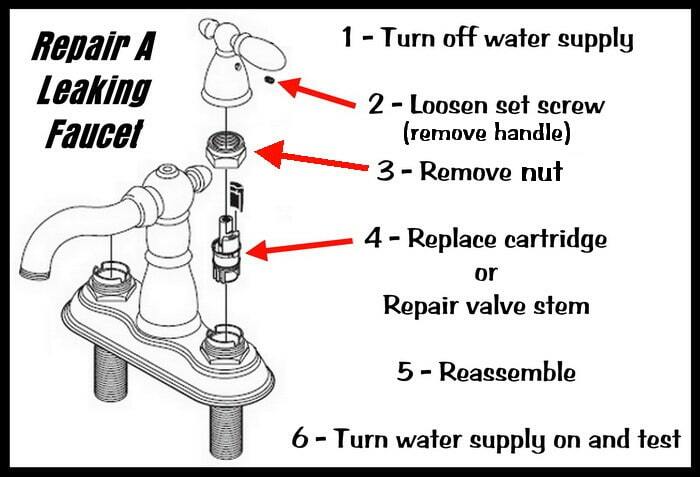 To fix a leaking double handle faucet, you will need to remove the cartridge, compression/valve stem, or ceramic disc. This worn out component causes water to leak either from the faucet itself or under the handles. 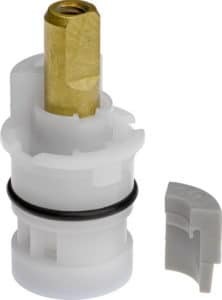 Remove this part from the faucet handle and match it up with a new one or replace the seals/o-rings/gaskets. 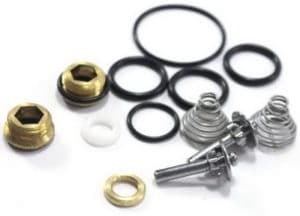 Use a faucet repair kit when replacing seals or o-rings. 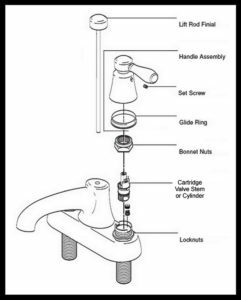 There are 3 types of faucets explained below, Compression Type (Valve Stem), Cartridge (Cartridge), or Ceramic Disc (Cylinder). 1. Turn both water supply lines to the faucet OFF. 2. Loosen the set screw on the faucet handle. 3. Remove the faucet handle/knob. 4. Unscrew and remove the valve stem. 5. Remove screw, gasket, o-rings, and washers from stem. 6. Apply plumbers grease to stem. 7. Install new screw, gasket, o-rings, and washers to stem. 8. 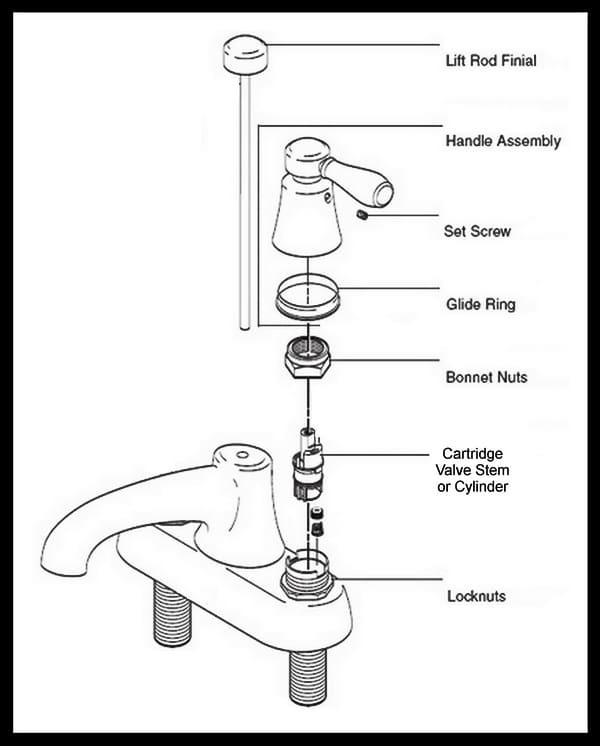 Remove valve seat from faucet. 9. Drop in the new valve seat into faucet. 10. Install the repaired valve stem. 11. Put the knob or handle back in place. 12. Tighten the set screw on the handle/knob. 13. Turn both water supply lines back ON. 3. Take the faucet handle off. 4. Remove the retaining clip/nut. 6. Drop in a brand new cartridge. 7. 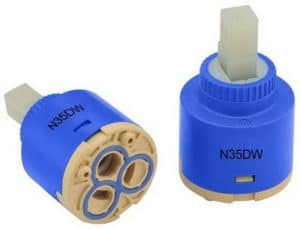 Install the retaining clip/nut. 8. Put faucet handle back on. 9. Tighten set screw on handle. 10. Turn both water supply lines back ON. 3. Remove the faucet handle or knob. 4. Unscrew the retainer nut. 7. Slide new cylinder into place. 9. Slide faucet handle into place. 10. Tighten the set screw on the faucet handle. 11. Turn both water supply lines back ON. The leak repair methods above will work with faucets in a kitchen, bathtub, shower, and bathroom. Need help with a leaking faucet? Leave your question below and we can assist to fix your leaky faucet.